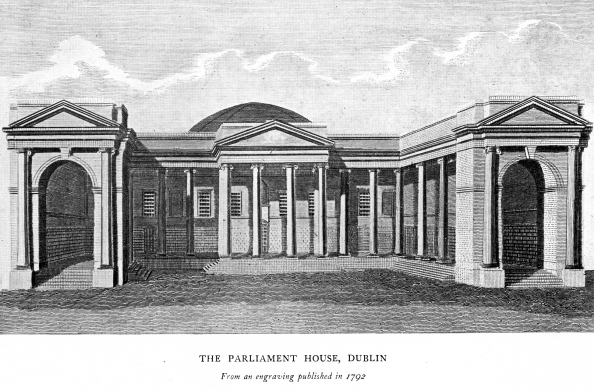 Universal Cry for Parliamentary Reform — Lord John Russell introduces the Reform Bill—The Reform Bill for Ireland introduced by Stanley—The Bill opposed by O'Connell and Sheil—The Bill receives the Royal Assent, 7th of August, 1832—Earl Grey introduces his Coercion Bill—It is passed by a Large Majority—The Tithe Question—The State of the Irish Church—Reduction of Irish Bishoprics—Address to the King presented by the Archbishop of Armagh —Reconstruction of the Cabinet—Lord Mulgrave's Viceroyalty—Louis Perrin, Attorney-General—He creates a Precedent by permitting Catholics to serve as Jurymen—Irish Municipal Reform—Dr. Cooke's Activities in Belfast—English Radicals attack the Orange Association—Lord Mulgrave's Rule in Ireland attacked by Jackson, M.P. for Belfast—Death of William IV. The reign of William IV was ushered in by a universal cry for parliamentary reform. The popular agitation was greatly increased by Wellington's declaration, in the House of Lords, that no reform was required and that none would be considered. The Duke's uncompromising attitude led to his resignation, and a Whig Ministry was formed, of which the chief members were Earl Grey and Lord John Russell. Brougham was Lord Chancellor, and Lords Melbourne and Palmerston were Secretaries of State. On the 1st of March, 1831, Lord John Russell introduced the Reform Bill in the Commons. The second reading was carried by a majority of one; but as the Government had not a sufficient majority to carry the Bill through all its stages, Parliament was dissolved. The whole country was thrown at once into a state of wild excitement, and serious rioting occurred at all elections. The new Parliament contained a large majority of reformers and the Bill was easily carried in the Commons, but the Lords threw it out on the second reading. Lord Anglesey, the Viceroy in Ireland, who had been recalled by Wellington in 1828, was again appointed by Grey; he understood Ireland better than his associates in the Government, and often complained that his views were set aside and his policy counteracted by the Chief Secretary, Stanley, who had a seat in the Cabinet. In 1832 ministers were too much occupied with the struggle for Reform to give proper attention to the question of social order in Ireland, where the question of tithes had become a fruitful source of misery and crime. On the 22nd of May, Stanley introduced the Reform Bill for Ireland. On the motion for the second reading, on the 26th, he said that out of 7,700,000 of the population the county constituency comprised 7,000,000, for whom there were only 64 representatives. He proposed to rectify this error by disfranchizing several small nomination boroughs and giving the representation to the counties and large towns. It was intended, he said, to make the representation as far as possible accordant with that of England and Scotland; and by raising the franchise (so that all tenant-holders of £50 a year, and all leaseholders of £10 for 99 years, should have a vote) suppress the evil influence by which the elections in Ireland had been frequently marred. The county constituency would, Stanley calculated, amount to something more than 52,000, of whom 22,000 would be freeholders, possessing more than £50 a year arising from freehold property. The Bill would give five members more to Ireland than she already possessed, one of whom was to represent the University of Dublin, so that it should have two members instead of one. By the Bill the constituency of Dublin would be raised from 5000 to 16,000. Seven of the largest counties would possess a constituency of from 15,000 to 16,000, and Belfast, "one of the most important towns in Ireland", would have a constituency of 2300 instead of 13. It was proposed to raise the ordinary rate of franchise from £5 to £10, and in order to meet the objections of Protestants Stanley declared that the change would not give to the Roman Catholic interest more than seven additional members. The Bill was opposed by both O'Connell and Sheil, the former of whom made a great effort to extend the franchise from £10 to £5 rentals, stating that even if they were to adopt that rate they could not obtain more than 25,000 electors in all the counties in Ireland. If they adopted the higher qualification there were six counties in which they would not find above 300 persons to enjoy the franchise, in seven others there were not more than 400, and in five others not more than 500; in three districts of the country, if they took the qualification of £100 of yearly income, he did not think that they would find more than from 500 to 700 voters. There were only eleven counties which would have 700 voters, and eight of these would sit in Protestant Ulster. Stanley replied that the arrangements of the Government had been based upon the calculations of Sir Henry Parnell, whose accuracy and impartiality no one could doubt, and he contended that the £50 clause would add very considerably to the Catholic constituency of many counties, especially those of Down and Armagh. The Reform Bill of Ireland received the royal assent on the 7th of August, 1832. In the beginning of 1833 the social condition of Ireland was deplorable. Earl Grey, in introducing his Coercion Bill in the House of Lords, enumerated no fewer than 9000 crimes of violence, almost exclusively agrarian, which had occurred in the preceding twelve months. Juries would not convict, murders were rife, and intimidation was almost universal. The authority of the law had practically ceased to exist throughout the greater part of the country. Lord Althorpe, the leader of the House of Commons, was in favour of less coercion and more concession. Stanley, however, "explained with admirable clearness the insecure and alarming state of Ireland", with the result that, according to Lord John Russell, "the House became appalled and agitated at the dreadful picture which he placed before their eyes. They felt for the sorrows of the innocent, they were shocked at the dominion of assassins and robbers." The Bill was so generally felt to be one of great necessity that at the conclusion of the debate there was a universal feeling in its favour, and on the 29th of March it was read a third time, and passed by a majority of 345 against 86. The Bill, having received the royal assent, was published, and on the 10th of April the Lord-Lieutenant issued several stern declarations, stating that he would not permit any political gatherings, and also that in the whole of Ireland there was no need for Volunteers (a body O'Connell had in a tentative manner re-established), and he proceeded to put his words into action, with the result that the newly enrolled association of Irish Volunteers forthwith disbanded and ceased to be. This Coercion Act was most beneficial to the country, the number of offences throughout Ireland being diminished from 472 in the month of March to 162 in the month of May. The year 1834 was an eventful one for Ireland. The Coercion Act was in full force. Crime and outrage were diminished, but discontent was as rife as ever. The tithe question was still unsettled, and Parliament was invited in the King's speech to take it once more into consideration. "I recommend to you", said the text, "the early consideration of such a final adjustment of the tithes in that part of the United Kingdom as may extinguish all just causes of complaint, without injury to the rights and property of any class of my subjects, or to any institutions in Church or State. The public tranquillity has been generally preserved, and the state of all the provinces of Ireland presents, upon the whole, a much more favourable appearance than at any period during the last year. But I have seen, with feelings of deep regret and just indignation, the continuance of attempts to excite the people of that country to demand a repeal of the Legislative Union. This bond of our national strength and safety, I have already declared my fixed and unalterable resolution, under the blessing of divine Providence, to maintain inviolate by all the means in my power." The session was almost exclusively devoted to the discussion of Irish affairs, the proceedings being marked by O'Connell's attack on the Government in connection with the extraordinary conduct of Baron Smith, an aged judge, who at the summer assizes at Armagh sat, for several days with brief intermission, for the trial of prisoners, from eleven o'clock in the forenoon of one day until six o'clock the morning following! Lord Althorpe introduced a measure for the cutting down of the Irish Church establishment to something like the proportion of the number of its adherents by reducing ten of the Protestant bishoprics. The Sees selected to be dealt with included those of Dromore, Clogher, and Raphoe. It was proposed to add Dromore to the Bishopric of Down and Connor, Clogher to Armagh, and Raphoe to Derry. It was decided in order to secure the interest of their successors that no Irish Bishop should be able to grant leases for a longer term than twenty-one years. Stanley lent his aid to the passing of the Bill by stating that on the election of a new Bishop of Derry the Bishopric, which originally amounted to £12,600 per annum, had with the consent of the incoming Bishop been reduced to £8000 per annum; and it would be further reduced by the operation of the tax to £7200; so that by the passing of the Bill a double advantage would be obtained. The Bill was carried under a strong protest from Conservative Peers, the Irish Protestant Church losing thereby half her hierarchy. The subject of tithes now received attention. During the previous session a resolution had been carried for advancing £1,000,000 from the Exchequer for the relief of the Protestant clergy, the greater number of whom were reduced to a state of absolute destitution caused by the difficulty experienced in collecting from the sources of their incomes. The Government now introduced a Bill founded upon a Clause of that resolution, the effect of which was the abolition of those parishes in which public services had not been held for three years, and a body of Commissioners was instituted to enquire and report as to how many parishes had become subject to this provision. The report, when issued, stated that of 144 such parishes 30 held full services, 26 regular but inefficient services, 22 were but partially served, leaving 66 subject to the effect of the Clause, to 10 of which it could not fairly be applied. The amount of tithes gathered from the country for these several livings amounted to £136,600 per annum. The charge of the Church cess had been arranged by the tax upon the bishoprics, to which many benefices were attached, so that the whole burden of this reduction of the Protestant Church must fall upon the small livings, the population affected being about 46,000, inhabiting about 10,000 dwellings. Such a wholesale proceeding, following upon the steps for the reduction of the bishoprics, filled the upholders of the Protestant ascendancy with dismay, especially as it severely touched the Protestant Province of Ulster. But although the Bill met with very strong opposition, it was passed on the 30th of July by a majority of 135 against 81. The effects of this measure were to some extent modified by an advance, to meet the requirements of the clergy, of £1,000,000 from the Exchequer, the arrears of tithes, to be collected by the Government at a reduction of from 15 to 20 per cent. This terminated the great struggle between the Catholic and Protestant Churches in Ireland. Irish Church questions attracted universal attention. Ward, member for St. Albans, having brought forward a motion for a general enquiry into the state of the Irish Church, found he was supported by Grote and Althorpe, who brought before the House a resolution praying the King to enquire into the state of the Church, and of Church property, in Ireland, and to have an enquiry made to ascertain the proportion in numbers and endowments between Roman Catholics, Dissenters, and Protestants of the Established Church. On a majority of 396 against 120 votes a Commission was issued, with the result that the Irish Protestant clergy, taking alarm, assembled and adopted an address to the King which, on being signed by 1400 clergymen, was presented to His Majesty by the Archbishop of Armagh. The King replied very graciously that he was warmly attached to the Church and was fully determined not to permit a single privilege of hers to be touched. The ministry regarded the attitude taken with regard to the Irish Church question in the light of a vote of want of confidence, and this led to the reconstruction of the Cabinet. Grey retired and Melbourne became Premier. Signs of a Tory reaction now became perceptible. These were welcomed by the King, who was alarmed by the progress of the reforming spirit. When Althorpe, Chancellor of the Exchequer, resigned this year (1834), owing to his transference to the House of Lords, the King seized the opportunity to dismiss the Melbourne Cabinet and to place Sir Robert Peel at the head of the Government. Peel appealed to the country but failed to obtain a majority, and, having held office only four months, was obliged to resign, Melbourne, in April, 1835, again returning to power. The chief measure of the session was the Municipal Reform Act, by which Town Councils were reformed. By this ratepayers and freemen were given the right to appoint town councillors, who elected the magistrates from among themselves. In 1835 Henry Constantine Phipps, second Earl of Mulgrave, was appointed Lord-Lieutenant, and Lord Morpeth became Chief Secretary. The Attorney-General was Louis Perrin, who had the courage to rescind the rule, till then observed by the Crown Prosecutors in Ireland, which required that Catholics should be set aside when called on the jury panel. "If we Protestants", said Perrin, "when accused rightly or wrongly of crime, were not allowed to have one of our own creed among the jurors, what sort of loyalists would we be?" This act of Perrin's put an end to the worst evils of jury-packing in Ireland. The three great Acts of the Melbourne administration as regards Ireland were the final settlement of the tithe question, the reform of the Irish Municipal Corporations, and the establishment of the Irish Poor Law. The Tithe Bill, introduced on the 25th of April, 1836, by Lord Morpeth, the Chief Secretary, contained a series of provisions for the appropriation of the surplus revenues of the Irish Church, estimated at £58,000, "to the promotion of religious and moral education in Ireland". Stanley opposed the Bill on the ground that no portion of ecclesiastical dues ought to be used save for upholding the interests of the Protestant Church. The Tithe Bill was rejected, but in 1836 it was again passed by the Commons and again rejected by the Lords. O'Connell upon this immediately proceeded to organize a National Association for the promotion of municipal and tithe reform and the superintendence of elections in the popular interest. He was joined in his crusade by Sheil, Cloncurry, and Sharman Crawford, a Protestant and large land proprietor in Ulster. The action of the last-named raised a spirit of resistance among the Presbyterians in the province, especially in Belfast and Londonderry. In Belfast a Presbyterian clergyman named Henry Cooke threw the whole force of his powers of courage and eloquence into the contest, and succeeded in making a powerful demonstration of Protestant principles. Dr. Cooke's energy in the cause to which he was attached was recognized in Belfast by the erection, after his death, of a bronze statue to his memory, which, owing to the hue it has acquired with time, is now, alas! popularly known as "the Black Man". The English Radicals and Irish Catholics made, in 1836, a heavy onslaught in Parliament on the Orange lodges in the United Kingdom. The Orange Association in 1835 had become very powerful in Ireland. It had many lodges in the army. The Duke of Cumberland was Grand Master, and Percival, a member of Parliament who held office in 1834 under Peel, was Grand Treasurer. A Colonel Fair-man, who had been very energetic in establishing regimental lodges, and was accused, before committees of the House of Commons, of treasonable practices, was Deputy-Grand Secretary. The proceedings of the Orange body were investigated by the Committee of the House, and the result was the discovery of a widespread conspiracy to change the succession of the crown in favour of the Duke of Cumberland. It was also ascertained that though the Duke of York had withdrawn from the Grand Mastership on being informed of its illegality, and had, as Commander-in-Chief, forbidden the formation of Orange lodges in the army, his brother, the Duke of Cumberland, who succeeded him in the Grand Mastership, had signed warrants for the formation of such lodges. A motion was made by Hume for an address to the Crown praying for the removal of every judge, privy councillor, lord-lieutenant, magistrate, militia officer, inspector, or constable who attended the meeting of any Orange lodge, any Ribbon lodge, or any political club whatever. This motion was successfully resisted by Lord John Russell, who wisely invited the House to "leave it to the King to take such measures as he might deem advisable for the effectual discouragement of Orange lodges, and generally of all political societies". This proved sufficient. The Orangemen undertook to comply with the wishes of the Crown, and the Duke of Cumberland withdrew from the Association. In January, 1837, the conduct of the Irish Government of Lord Mulgrave was bitterly attacked by Mr. Serjeant Jackson, one of the members for Belfast. The Lord-Lieutenant defended himself ably, but such was the spirit the subsequent debate produced that Morpeth was shortly afterwards recalled. On the 20th of June the King died. He was succeeded by his niece, the Princess Alexandrina Victoria, only daughter of the Duke of Kent.